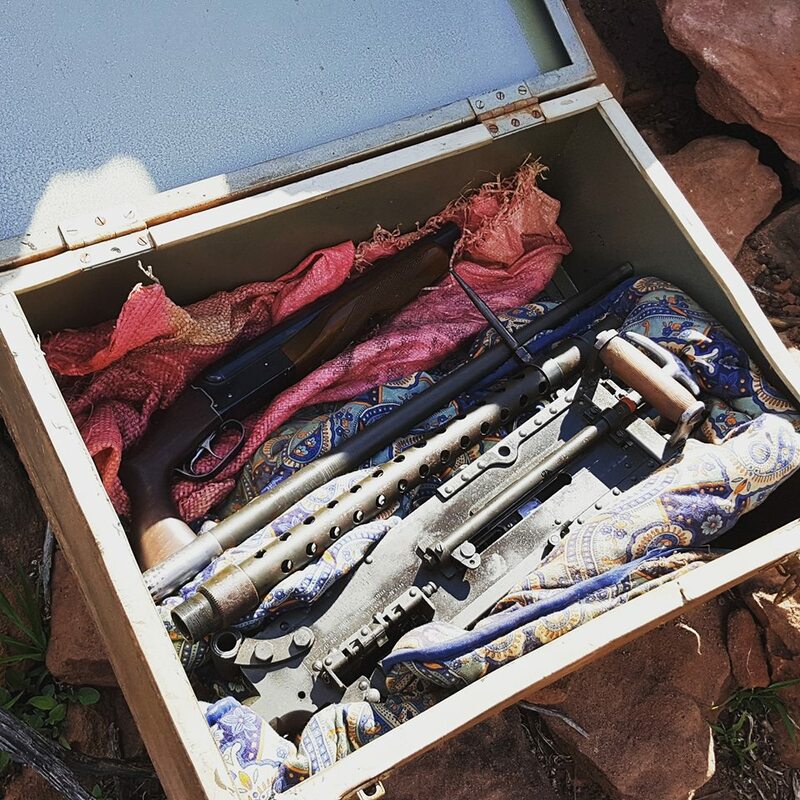 Images and information first shared to Facebook (following a Tweet from the Kalbarri Police) by Ross Williamson, a lawyer specialising in firearms law, show a pair of firearms apparently recovered from a cache near Kalbarri, Western Australia (WA). According to Williamson, the guns were recovered by “some adventurous children on a family holiday at Murchison House Station”. 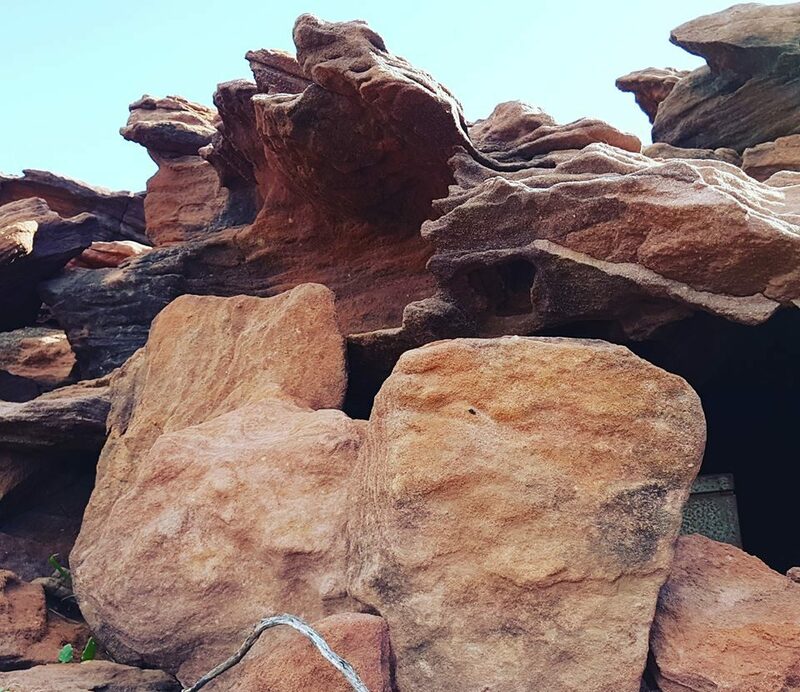 Murchison House Station, founded in 1858 and now run by Callum and Belinda Carruth, offers accommodation and tours at one of the oldest pastoral stations in WA. The more surprising of the two firearms is a belt-fed machine gun; a .30 calibre Browning AN-M2 aircraft machine gun, more specifically. Originally developed by the US Government’s Springfield Armory as the M1922, Colt picked up production with minor changes in 1931, also developing and marketing a commercial version internationally, known as the MG40. The AN-M2 was later produced by three major manufacturers, all located in New York state: the Brown-Lipe-Chapman Division of General Motors in Syracuse, Buffalo Arms in Buffalo, and Savage Arms in Utica. According to Fleischman (2003), US production records indicated that some 70,000 of the nearly 200,000 AN-M2 machine guns built during the Second World War were sent to the UK. Some of these Lend Lease guns were also supplied to Australia, both directly and via the UK. Markings on this particular gun indicate it was produced by Buffalo Arms. The receiver markings also record the government inspector’s initials (RLB), as well other details regarding the manufacturer, model, calibre, and relevant patent numbers. A combination of the markings and physical features indicate that this weapon was produced between August 1941 and January 1945. The AN-M2 was used both as a fixed, wing-mounted gun and in both single and twin articulated mounts, from its introduction up to and including the Second World War. The .30 calibre cartridge was later considered by US forces to be insufficient for engaging increasingly larger and more robustly-constructed aircraft at increasingly longer ranges, and the guns were largely relegated to second-line use or phased out during and immediately after the Second World War. The British and Australians, however, continued to employ the .30 calibre guns throughout the War. After WW2, some guns saw further service in Korea, and a handful were even employed during Vietnam. Chambered for the .30 calibre M1906 cartridge (and other, later .30-06 loadings), the AN-M2 weighs more than 25 per cent less than the M1919 series land service machine guns it was derived from. It makes use of the M1 disintegrating link, and cannot feed from the cloth belts also compatible with the M1919 series. In the case of this particular gun, the barrel jacket is of the most common ’52 hole’ pattern, rather than the later ‘86 hole’ design which was introduced alongside an expanded barrel throat diameter to enhance cooling. The muzzle device fitted is the US military issue two-piece booster design, differing from other devices which incorporated different booster designs, flash hiders, or simple muzzle nuts. The presence of a pair of so-called ‘spade’ grips and the front sight post (the rear sight appears absent) indicate that, at least at some point in its life, the gun was designed for use from a turret or flexible mount. However, the grip assembly appears to have been added at a later date, and the rough appearance of these components may indicate they were produced locally when the weapon was converted from a previous fixed mount role. The distinctive ‘T’-shaped side-mounted retracting assembly was typically employed where the weapon was fitted in a tight location with no room for a conventional side-mounted charging handle. The front sight and backplate are likely to be original, although they may also have been fitted at a later date. The AN-M2 was fitted to a wide range of aircraft operated by the RAAF, such as the Brewster F2A Buffalo and the Consolidated B-24 Liberator. The other firearm is a rather more prosaic sawed-off shotgun. In this case, according to Williamson, the shotgun was originally produced by Boito, a Brazilian manufacturer with a mixed reputation for quality within Australian firearms circles. The gun is of break-action, double-barrelled design, with a very short barrel and pistol grip-only configuration to enhance concealability. Williamson says that he was told, many years ago, that “Boito factory workers would in their “own time” make for “unofficial” buyers very short barrelled shotguns with pistol grips”. Whether this is the case remains purely speculation, as far as this author can tell. Sawed-off shotguns are reasonably common within the limited illicit circulation of firearms in Australia. Both firearms would be illegal for typical license holders under Australian law; according to Lou, both were recovered “in perfect working order”. Whilst the sawed-off shotgun is not especially noteworthy as an illicit firearm in Australia, the AN-M2 is a highly unusual find and, if functioning, no doubt a cause for some concern to authorities. Found on its own, such a gun may potentially viewed as a curiosity or war relic, but the presence of the sawed-off shotgun will likely raise questions as to the intended use of the AN-M2. 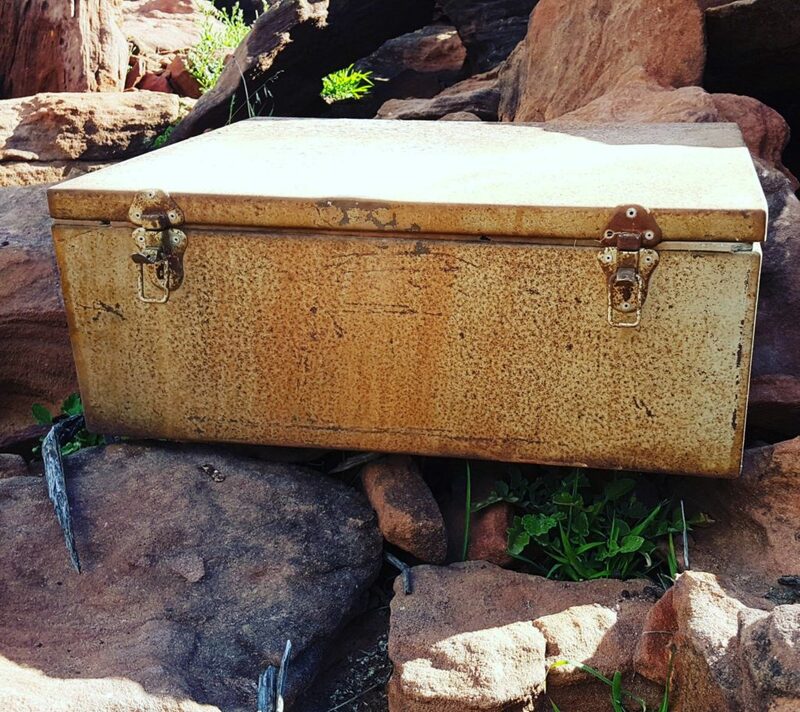 How the firearms found their way to this cache, and who stashed them there, remains unknown. 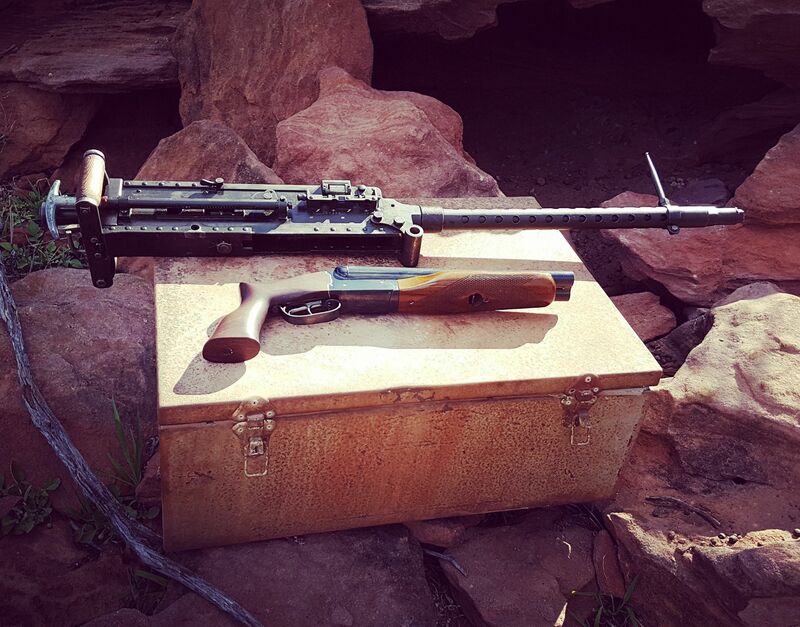 According to Williamson & Lou, the firearms are now in police custody, with the hope that the weapons will be rendered inert and returned to the Carruths for their historical value. These weapons certainly do have a story to tell. Note: This post was updated on 29 September 2017 to incorporate new information and images – Ed. Specifications taken from Fleischman, 2003. Images courtesy of Courtney Lou. Special thanks to Ian McCollum & Courtney Lou. Fleischman, Steve. 2003. ‘The 30 Caliber AN-M2 Browning Machinegun’. Small Arms Review. Vol. 6 No. 7. April, 2003. Goldsmith, Dolf. 2005. 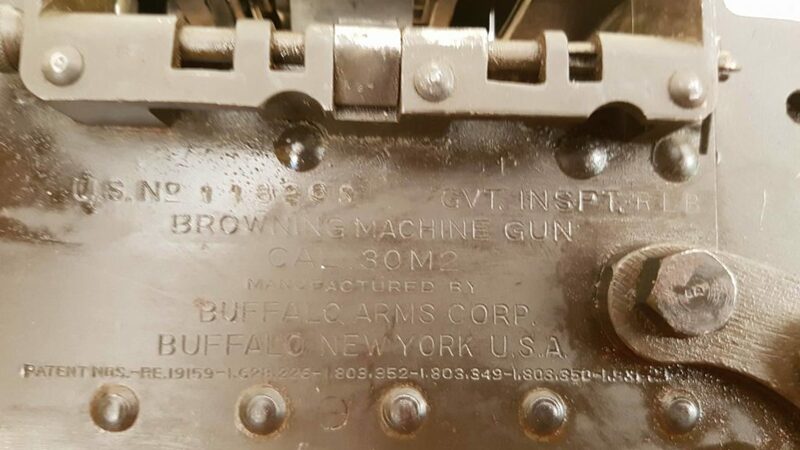 Browning Machinegun, Vol. I: Rifle Caliber Brownings in U.S. Service. Cobourg, Ontario: Collector Grade Publications. 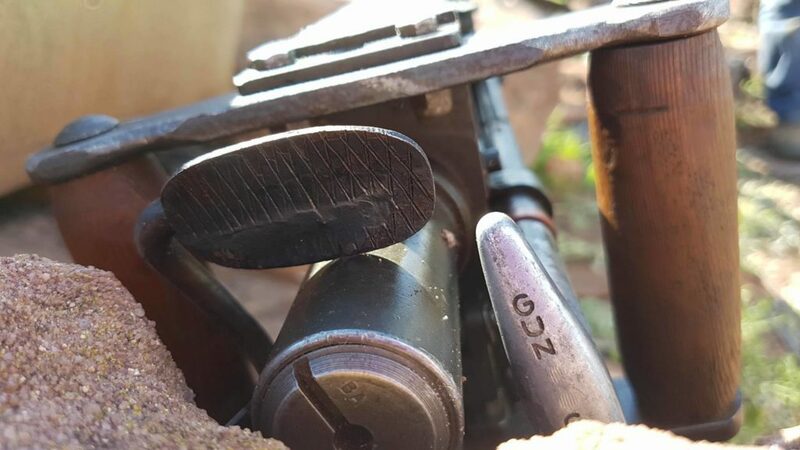 The author is correct, those are not the original AN-M2 spade grip assembly. The cast aluminum grip on the retracting handle would indicate earlier wartime production, as the later one’s were bent tube. The matching rear sight for that front would have been the “spider” sight. Don’t recall any USAAF use of the .30 on Mustangs unless possibly the A-36 model. Dave, thank you for the comments. As we understand it, the .30 was fitted to Australian built P-51D, produced by the Commonwealth Aircraft Corporation in Victoria, and designated the CA-17 or CA-18 in service. Interesting, as the first batch of 51’s to Commonwealth were kits, and would have come from the states with gun mounts, ammo trays, solenoids and charging systems set up for the .50. Would really like to see pictures if you have a source, for nothing would line up easily for a .30 to be used. But the Aussies are an innovative lot, so it’s not outside the realm of possibility. But nothing from the .50 set up would have worked. Australian P51 Mustangs were equipped with 6 x .50 caliber M2 A/C machine guns.